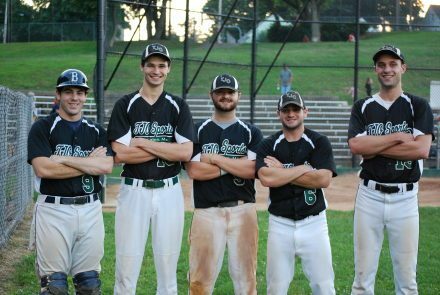 Five Mansfield baseball players who started together in Little League who are now either in college or recent graduates are still playing ball together in the Boston Park League, the country’s oldest amateur baseball league. 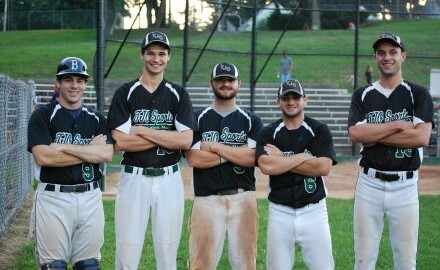 Robert and Chris “C.J.” Johnson, Michael Perillo, Dan Gad, and Ben Blaisdell are all members of the of the TJO Sports team in the Boston Park League. They play third base, first base/pitcher, infielder/outfielder, catcher, and shortstop, respectively. 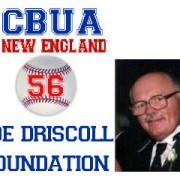 The team is coached by longtime Mansfield Little League coaches Bob Johnson, Robert and C.J.’s dad, and John Perillo, Michael’s Dad. Each of them baseball for their college teams–Robert at Suffolk class of 2013, C.J. at Nichols College class of 2015, Michael at Newbury College class of 2014, Dan at Brandeis class of 2014, and Blaisdell at Curry College class of 2011. Now, all of them are once again playing together on the same team. “Those five have been staples on the team all summer,” said Gad, noting that Dan has the highest batting average in the league this season. 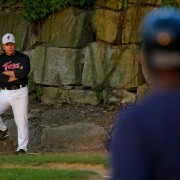 Tuesday night, the TJO Sports team played their last game of the season against ADSL. They lost 7-3, missing out on a spot in the playoffs, but “they didn’t go down without a fight,” said Gad. Written by Jeffrey Fish (Editor), Mansfield Patch.